The days are winding down as we near the end of this adventure, taking 11 Navy Seabees back 47 years in time to a place that was our hell. This return we find the country very welcoming, smelling a whole lot better than we remember, however the heat and humidity has not changed. What is left of the Liberty Bridge, a wooden bridge the Seabees constructed. Today our adventures took us to the site of Liberty Bridge in Quang Nam Province in Vietnam. Liberty Bridge that once connected An Hoa combat base to the outside world across the Song Thu Bon River. Built in 1967, the vital link was defended fiercely, first by Marine and later Army units. The longest wooden bridge in South Vietnam in the late 60 to early 70s. Once you crossed the river you entered a nightmare hell on earth called the Arizona Territory. This was bad country. 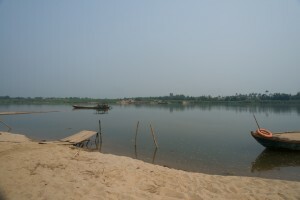 The convoys were most exposed while crossing the river. My Son Holyland ancient building Heritage site. We spent a great deal of time at a National Heritage site. 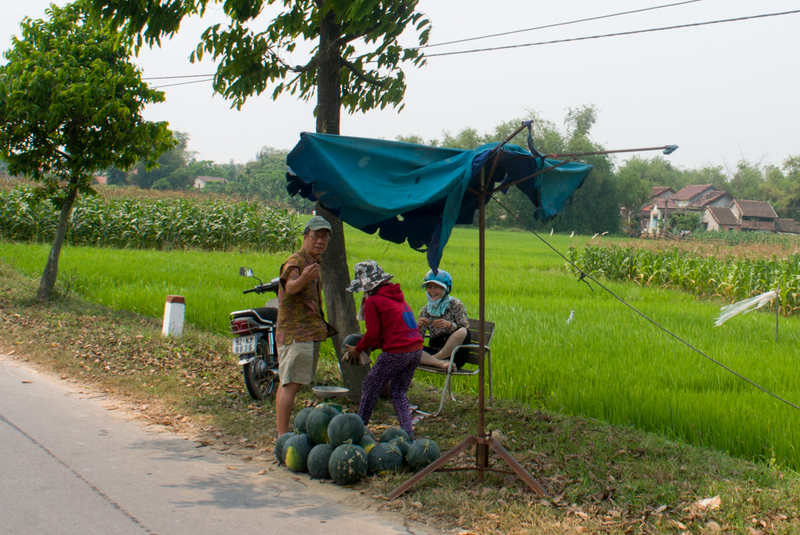 Vietnam is famous for its naturally attracting destinations, among which My Son is one of the tops. It dates back to the 2nd and 15th centuries. My Son in a narrow valley in Duy Tan Commune, Duy Xuyen District, Quang Nam Province. It is southwest of Danang City, It is a group of Cham people’s temple towers. The Kingdom at My Son was formed in the 4th century, until 13th century it was still occupied. It is the longest occupied of all the main SouthEast Asia’s monuments. It is regarded as a religious and intellectual center where Champa kings were crowned and buried. And there are water buffalo everywhere including the site of An Hoa Regimental Combat base. 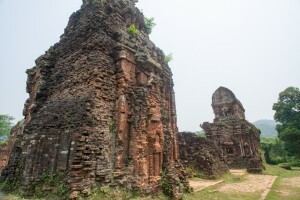 The base was located approximately west of Hội An and west northwest of the Mỹ Sơn temple complex, near to the Tinh Yen River and the An Hoa industrial complex. The base was first used by the Marines in January 1966, 12th Marines established a firebase there. In August 1966 the Navy Seabees including one who is on our trip, completed the construction of the “Liberty Road” between Danang and An Hoa. The airfield was capable of handling C-7, C-123 and C-130 aircraft. Purchasing watermelon from a roadside stand. We stopped at a roadside stand to buy some watermelon, you have never tasted anything so sweet as these that were in the garden just a few hours ago. 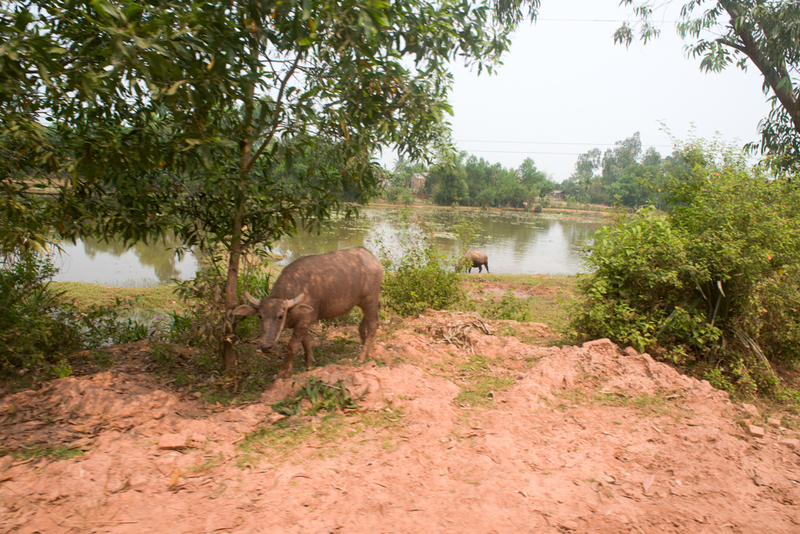 The day proved exhausting with temperatures in the upper 90s and the humidity near 100%. I hope you have been enjoying this blog, please take a few moments to leave comments. We continue back to Danang tomorrow then to Saigon on saturday.